Put the lamb in an oven dish and mix together all the wine, lemon juice, oil, rosemary and parsley. Cover and leave to marinate for a good couple of hours, but ideally over night. To make the roots, boil the carrots and parsnips in salty water for 8 minutes. Toss the roots with the oil, honey, garlic and shallots. Lay out a large sheet of foil and spread out the vegetables so that they are next to each other but not on top. Place the spring of rosemary on top and wrap tight in the foil. To make the stuffed cabbage leaves, heat the oil in a large frying pan and fry the oil until soft. Add the squash and fry for 10 minutes, or until the squash has softened. Add the chopped cabbage and the leek and fry for 5 more minutes. Stir in the spices and fry off for a final couple of minutes before turning off the heat and stirring in the cheese and seasoning to taste. Lay out the cabbage leaves and divide the mixture between them, placing into the centre of the leaf. Roll up the cabbage leaves to seal in the mixture and then wrap tightly in cling film. Once you have wrapped all the leaves in cling film, place them on a barbeque friendly tray. These can then just be put on the barbecue for 5 minutes to heat up before eating. Cook the lamb for 13-20 minutes (13 if you like it rare, and 20 if you like it well done) on the barbeque, turning every minute to get an even cook without burning. Once cooked, remove from the heat and leave to stand for 10 minutes before carving. To cook the roots, they will need 10 minutes on each side on the barbecue. 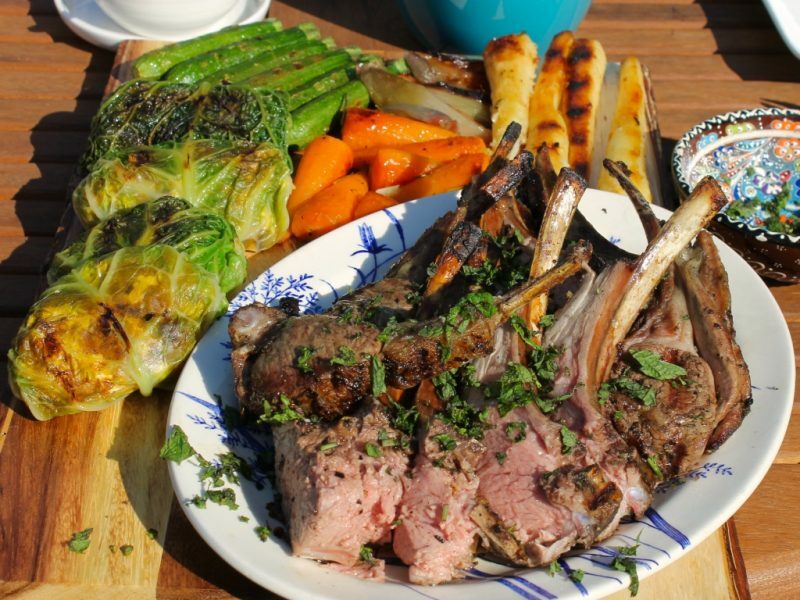 Once all your elements are cooked, plate up and enjoy with a dollop of mint sauce. This looks incredible, I can’t wait to make it!